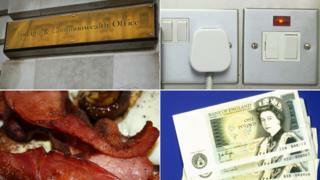 Requests for information about recruiting a butler and shops selling English bacon are among the bizarre calls made to British consular staff, the Foreign Office has said. It has revealed the strangest inquiries of the year to remind the public its helpline should be for emergencies. A call was also taken from a man planning to move to Spain who was worried about encountering nudists. But the vast majority were from Britons needing genuine assistance. The Foreign Office said almost half a million calls were made in the last year to its consular service number, which provides emergency help to Britons in trouble overseas. It dealt with 3,250 Britons in hospital, 4,770 who were arrested, and the families of 3,670 who died overseas. Nearly 38,000 replacement travel documents were issued. A man in South Korea asking what he could do with old pound notes. Foreign and Commonwealth Office Minister James Duddridge said consular staff "do an amazing job helping out Brits in trouble around the world but they are there to help with genuine emergencies and not as an alternative to directory inquiries". Head of the FCO's Global Contact Centres Kelvin Green said: "We receive thousands of calls a year, and do all we can to help people who find themselves in difficulty abroad. "But we cannot help people make travel arrangements or lifestyle plans, lend them money or pay medical and other bills for them." What happens to lost and stolen passports?